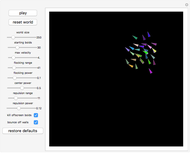 This Demonstration implements the boid algorithm to model flocking birds. For detailed information about a manipulable setting, hover over the name of a setting to display a tooltip. Each boid considers all other boids within a set distance to be part of its flock, adjusting its own velocity to both match that of flock members in its cone of vision and gather toward the center of the flock. Furthermore, boids will attempt to avoid collision with other boids. Sir Spinach. Boids. [Video]. (Aug 2, 2012) www.youtube.com/watch?v=I7uR_DG0blY. C. Parker. "Boids Pseudocode." (Aug 2, 2012) www.kfish.org/boids/pseudocode.html. 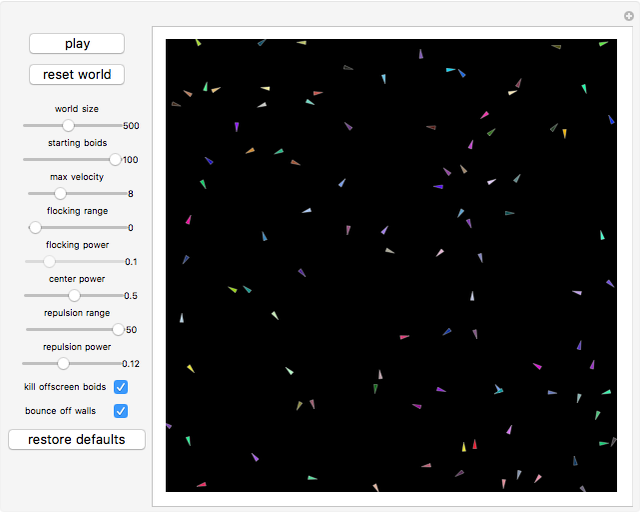 Steven H. Wang "Boids: Simulated Flocking Behavior"